Why can't I drop off or pick up on Sundays? 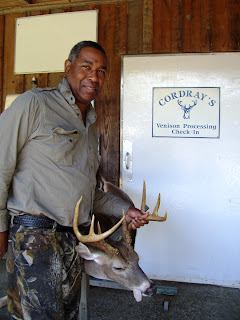 Cordray's Venison Processing has grown from a small backyard part-time business to a thriving operation that includes Cordray Farms. We hire over 25 employees and are open for 82 hours per week. And now our son, Kenneth Cordray, operates Cordray's Taxidermy from the same location. For our sanity, spiritual life, and health, we must have some time off each week and since the shop is in our backyard, we have to be closed to take time off. Even though you are a friend, opening the shop for that "just a few minutes" it takes to check you in or out disrupts our one morning of rest. We open the gate at 6 p.m. on Sundays. Please understand when we are unable to help you on Sundays before 6 p.m.
From Sept 12 to Oct 10, Public Alligator season, we'll be open for checking in alligators on Sunday mornings from 9 am to 12 noon. We won't be able to check in deer during this time since we won't have our regular crew in, but we'll be able to check in alligators. After the alligator season ends on Oct. 10th, we'll go back to our regular hours opening at 6 pm in the evening on Sundays. Michael's gotta find another spot to rest! We've dropped the corn prices to $6 for shelled corn and $7 for cob corn. This photo doesn't show it, but this deer had a very swollen neck. It's the third one we've gotten in that shows obvious rut signs. 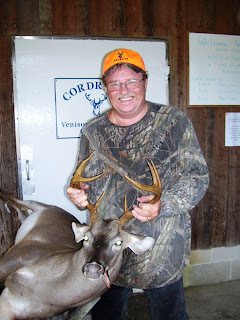 Both this deer and Gene's were taken in later morning. The full moon has them moving during the daylight hours. 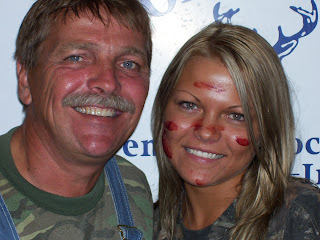 And it was her first deer, too! Hudson got this 100 lb 5 point as his first buck! I took this big rug I made for a customer last year on a road trip over the weekend to visit the Alligator Hunting Seminar in Moncks Corner. I got a chance to say hello to lots of old customers and maybe to a few new ones. Everyone sure seemed to enjoy the alligator sausage and venison snack sticks we sampled! 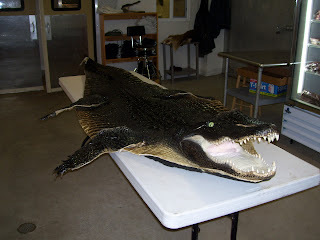 I got a chance to tell everyone what we're planning here at Cordray's for alligator taxidermy and processing and to hear from the source all the rules and regulations. 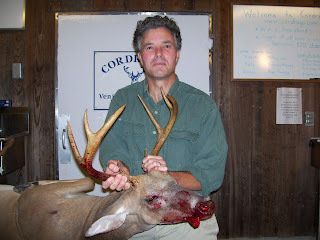 One difference from last year is that the public hunt season will begin at 12 noon, not midnight on Sept. 12th. One thing we're doing new this year is opening up on Sunday mornings during the public gator season to take in gators. We'll be open 9 am to 12 noon on Sundays from Sept 12 to Oct. 10th. After Oct. 10th, we'll go back to our regular schedule being closed on Sundays until 6 pm. 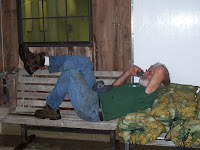 This Sunday morning time is just for checking in gators, we won't have the staff on hand to take in deer. 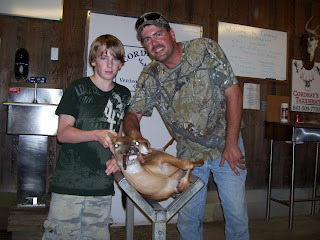 Check out the pictures of the alligator mounts from last year. Hope to see you soon. Please help us to recycle our boxes! We reuse those waxed covered boxes that you get your venison and beef in. Please bring them back the next time you visit or bring a cooler when you pick up. Those boxes are way too expensive to throw away, so if you can't use them for storage, stack 'em up and bring them back to us on your next trip. THANKS! And this one brought in by Matt Bollenberg dressed at 135 lbs! 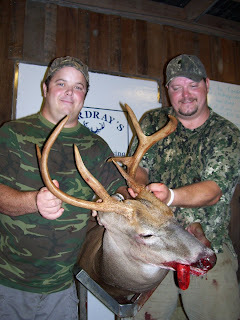 Matt wins the treestand for the first 2 weeks of the season! 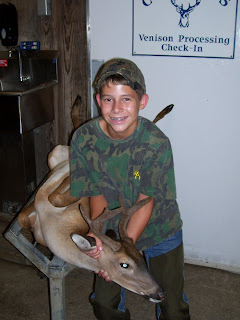 Young Mr. McDonald got his first deer, but I missed your first name! Not doing too great tonight! Jason McDonald is a longtime customer, but tonight the honors were for his son. 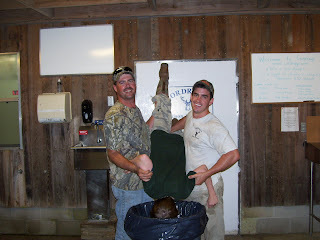 We dunked him for his first deer, but I don't have your name. Contact me and I'll update this post. 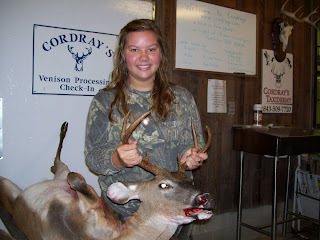 Allie Burnett got her first one! A 100 lb. 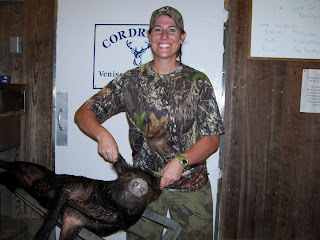 wild hog! So sorry I missed your name! Please send me your name and I'll post it! Use the comments below or email me at claudia@cordrays.com. Sometimes the pictures don't tell the story. When we get extra busy, we're too busy to take photos! So just an update on what we're seeing. Almost all the velvet is gone. One deer yesterday had some strips still hanging on, but almost everything else was clean. 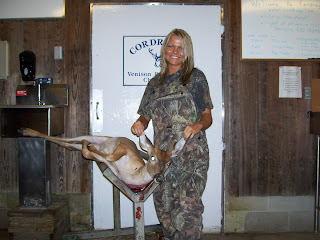 We even had one deer with a telltale swollen neck. SURPRISINGLY early for that! 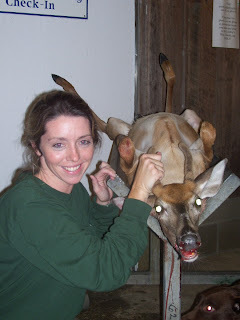 People are seeing doe groups with yearling fawns. There's been a little talk about how the acorn crop is going. Here, at our house, the oaks are loaded with acorns. But we heard from a guy in Ridgeville and they don't seem to have many at all. On years that the acorns are heavy, the deer stop eating corn and retreat to deep in the woods when the acorns fall in October. That does not bode well for getting the big guy if that happens just when rut is in full swing. What are you seeing out there? Post here under comments or email it to me at claudia@cordrays.com and I'll pass it along.